Image: Grivina/Getty Images. Design: Ashley Britton/SheKnows. I’ve always wanted to have kids. I love them. I loved the idea of being a mom. But whenever I imagined my own future experience of motherhood, I pictured myself with a 2-year-old toddling around on the playground or taking an excited 9-year-old back-to-school shopping. I do not love newborns. My own dad sounded vaguely concerned once when I mentioned my indifference. He seemed to think it was bad juju to say out loud that I wasn’t looking forward to my child's infancy. When he said, “It will be different when it’s yours,” it wasn’t a reassurance; it was almost a command. I heard it so often, I started to believe it. Media — both social and the Hollywood kind — sent a very clear message: The second I am handed my baby, my world will change. I will be filled with a love I never knew existed. My heart will burst open at the seams, as though the doctor is passing me a physical manifestation of love itself. I will be overjoyed. My life will be complete. I hung onto these thoughts, letting them propel me through the rising concern that came with my approaching due date and the knowledge that a strange bug-eyed, alien-looking newborn wailing at me was approaching ever nearer. I stayed awake late into the night during my third trimester reading The Happiest Baby on the Block, feeling oddly reassured that the colicky period tended to only last until about 8 weeks. "Maybe I’ll start liking this sooner than I thought," I’d muse. But nothing made me excited to have a 3-week-old. When my daughter was born, I knew right away that it was not “so different” just because she was mine. My immediate emotions were all directed inward: intense relief that labor was over, swelling pride that I had done it on my own (a vacuum had loomed perilously close to me during the final minutes of pushing). Then, underneath that, I identified how I felt about my baby. But I knew that it wasn’t love. The word floated into my mind from my hospital bed. Obligation was exactly what I felt. It was a sense of duty, which actually dovetailed nicely with the pride I felt; this was an occasion I would rise to willingly and handily. But even in my delirious state post-labor, I knew that if my friend hadn’t normalized it by sharing her own experience with me, all I would have noticed was the absence of that world-shattering love. I would have felt like a monster. I’d never heard another mom confess to not feeling love right away — though I suppose “our hearts are bursting with obligation” is a pretty terrible Instagram caption. But when I posed the question to other mothers, I was surprised (and a little relieved) that many of them didn’t get that delivery room rush either. Maybe our schtick was a little dark, but it made me feel so much less wrong during those terrifying first weeks. 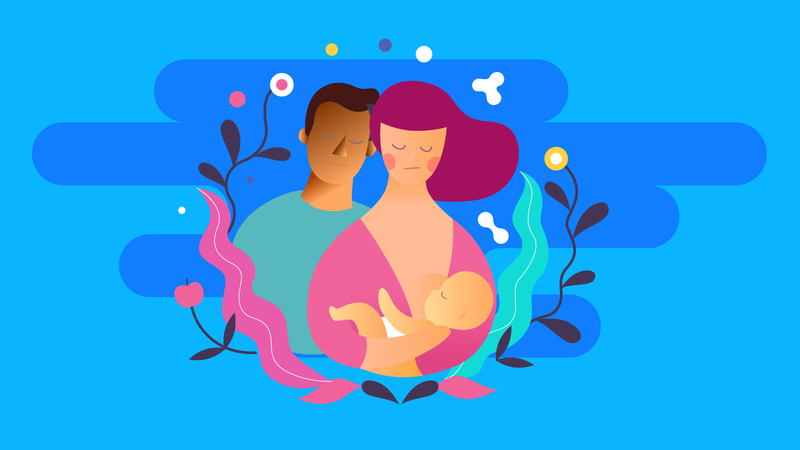 But many of the moms I talked to didn’t feel like they could share their own slow-growing love with anyone, even their partner, because of judgment and stigma. Patricia, for one, explained that her husband did feel love instantly, which was particularly alienating for her. “I didn’t feel like I could talk to anyone about it — at least anyone that had kids,” she said. Bottom line? We’re definitely not alone. And that love? It will come. I don’t remember the first time I realized I loved my daughter, but I do remember the first time it felt like my heart might burst. I was driving, just me and her (and the aforementioned beloved dog), and I looked in the back seat to see her sleeping. She was almost 12 weeks old. She looked so big — like a real kid. It was everything.